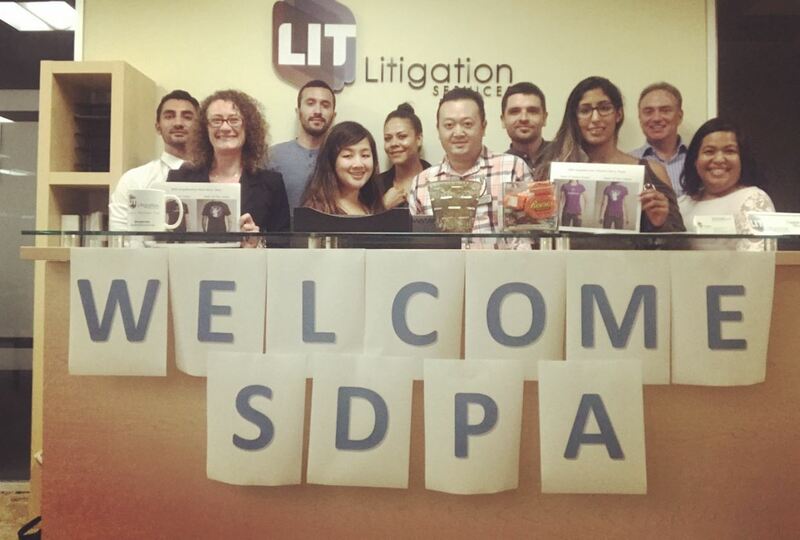 SDPA's September Mixer at Litigation Services! 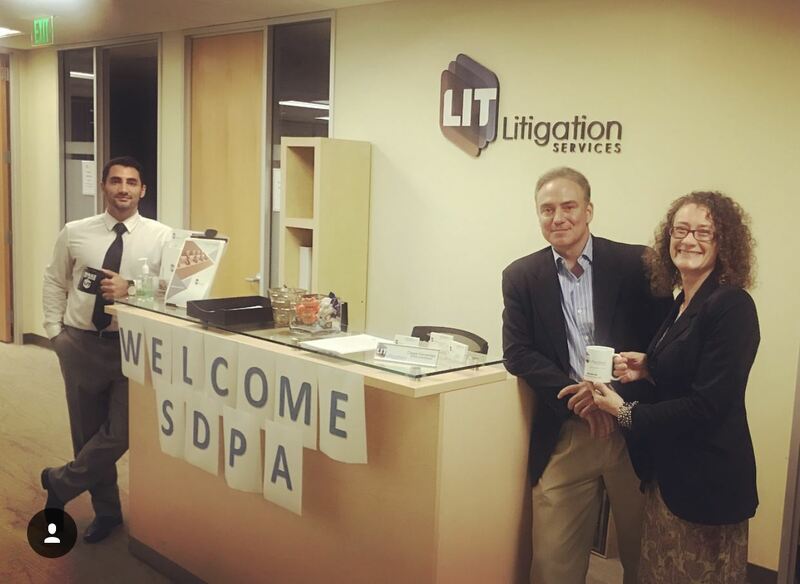 Many thanks to Litigation Services for hosting SDPA's September membership mixer and membership meeting in their beautiful office! Litigation Services offers court reporting and deposition transcript services. Richard Gilbreth and Stephen Silveira were wonderful hosts. 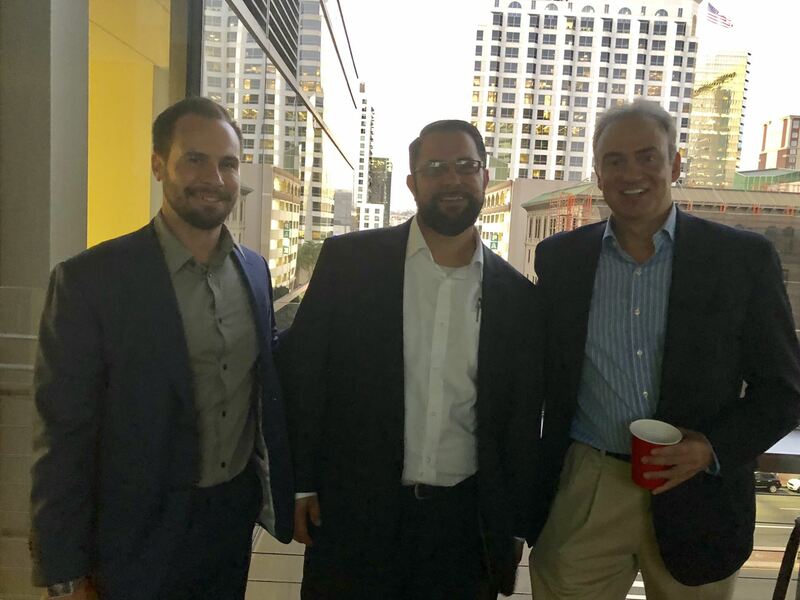 On September 19, 2018, SDPA held its September mixer and membership meeting at Litigation Services on 655 West Broadway, San Diego, CA 92101, on the sixth floor overlooking downtown. 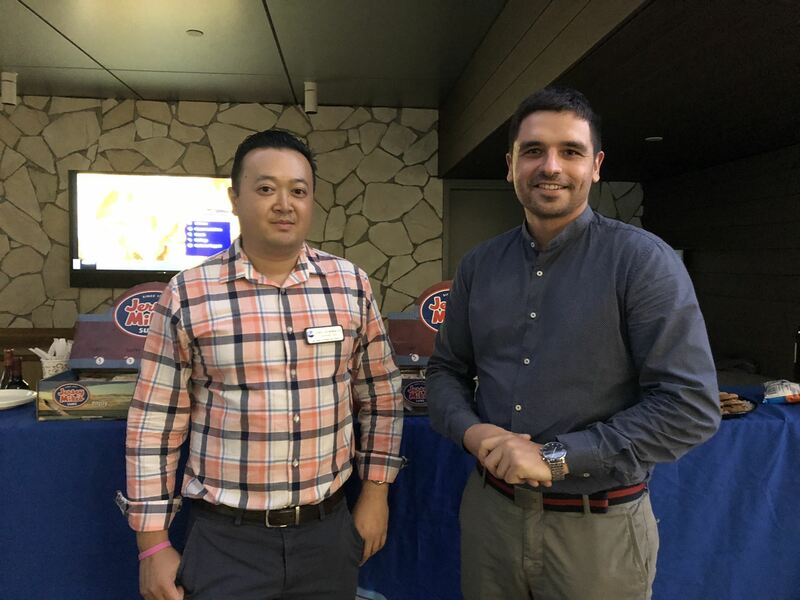 Guests mingled over wine, beer, and Jersey Mike's sandwiches and chips and cookies. 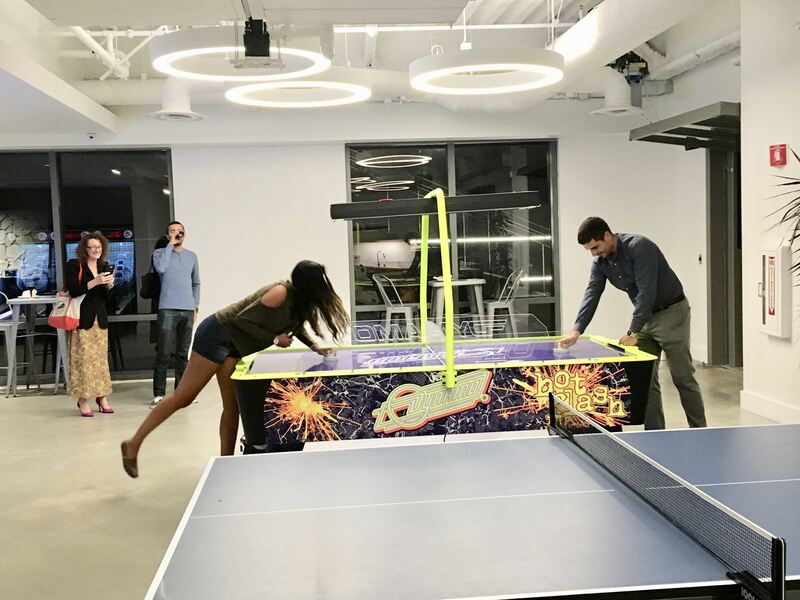 Litigation Services also opened their game room, which had skee ball, a ping pong table, and other fun arcade games. San Diego County Mock Trial Competition training will take place on October 3, 2018 at noon - the competition will take place from February 6, 2019 through February 23, 2019. Please email president@sdparalegals.org for more information. 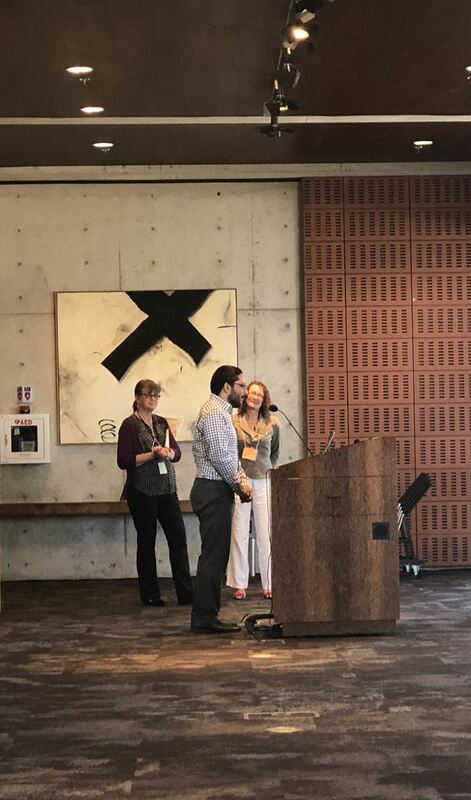 At the October tech conference set for October 13, 2018, SDPA will be also be hosting a blue jeans drive for our 2018 charity of choice, StandUp for Kids. We are taking in any sizes or styles appropriate for ages 12 through 20 - it can be used or new. Bring any jeans with you to the conference. 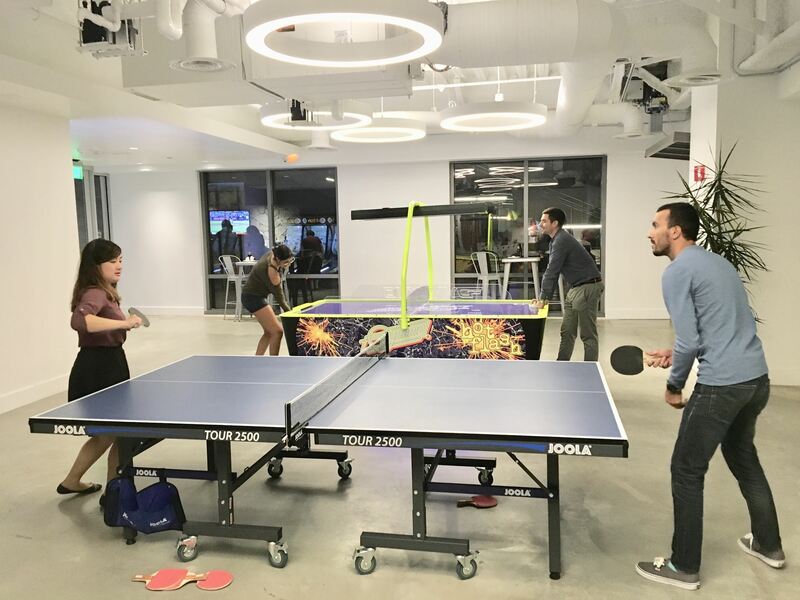 SDPA hosts a lot of fun mixers. Please come to our next one! 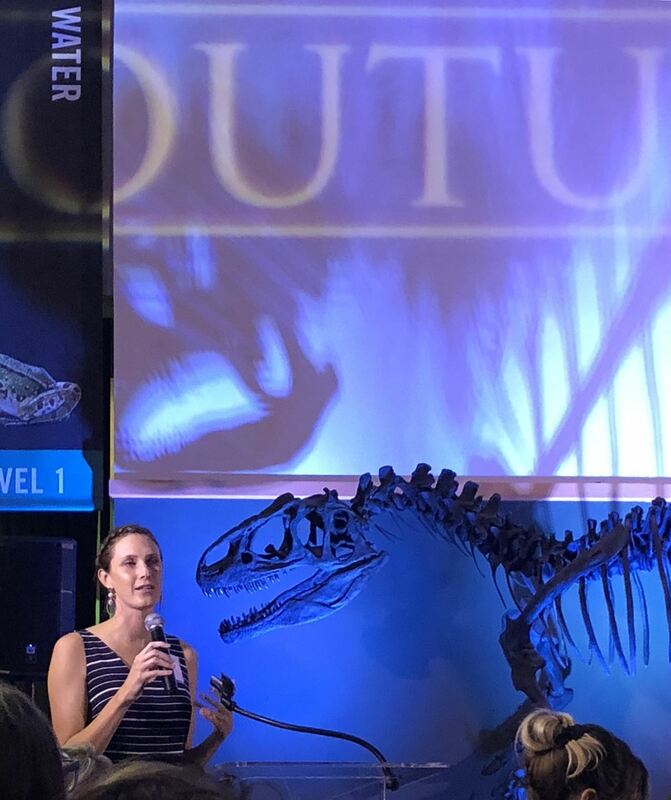 You can visit the events tab to see what events are coming up next. 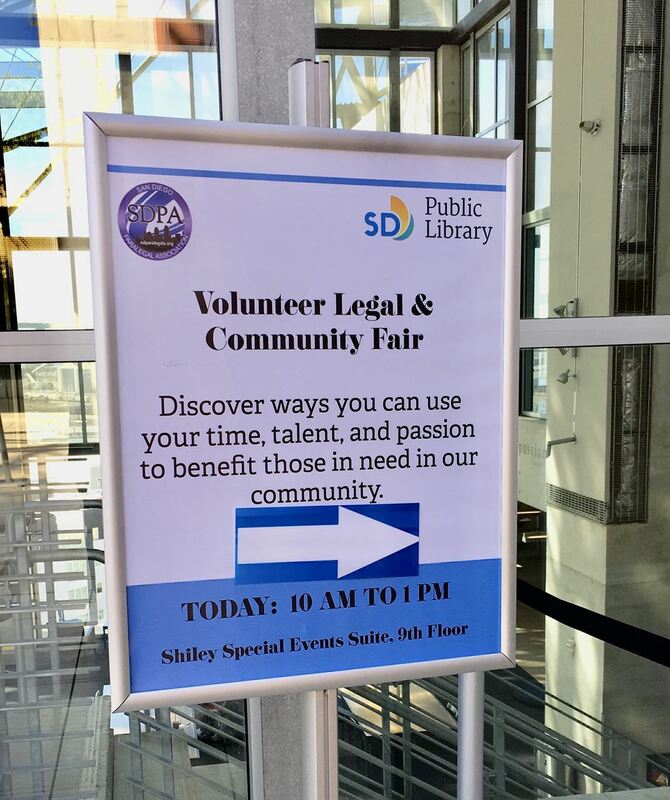 On September 15, 2018, SDPA held its second annual pro bono (volunteer and legal community) fair at the San Diego Central Library. The event was open to the public, so among attendees were members of the community. 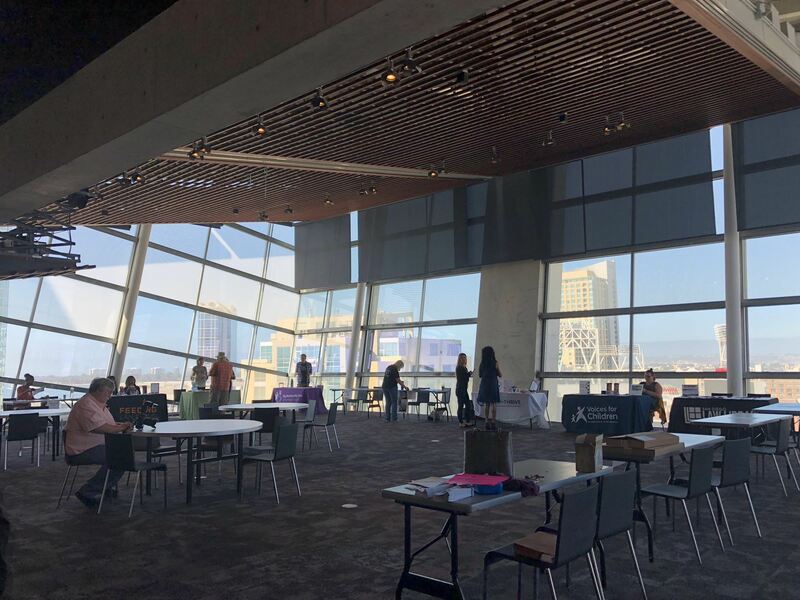 The pro bono fair was held on the top floor of the library - a floor with high ceilings, tall windows, and an outdoor space overlooking San Diego. Coffee, muffins, and juice were served at a little banquet table. Organizer of the event, SDPA's pro bono director Dawn Regner, introduced speakers on behalf of each of the participating organizations. 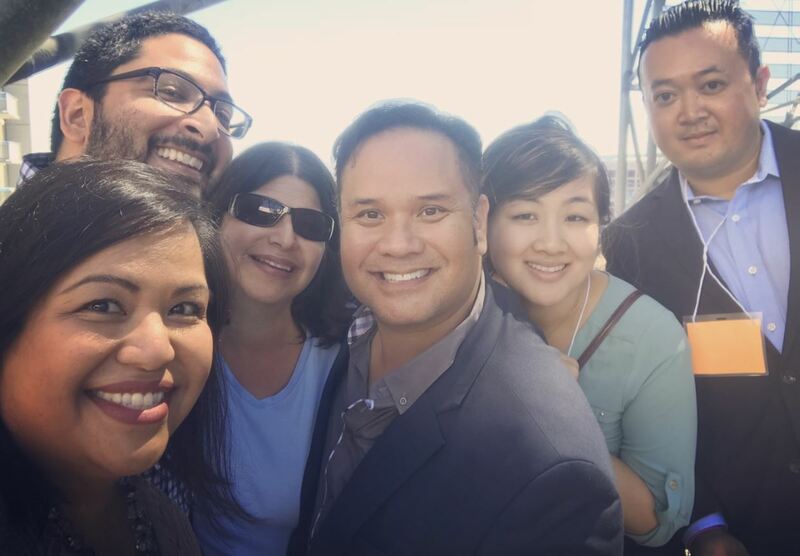 Board members of LAPA - Los Angeles Paralegal Association, Bobby Rimas, Executive Vice President, and Herbert Ortiz, Secretary Pro Tem, also attended to show their support. Paralegals unite! If you couldn't make it to this wonderful event, don't despair - there's always next year! In the meantime, you can sign up for SDPA's pro bono newsletter by emailing probono@sdparalegals.org. 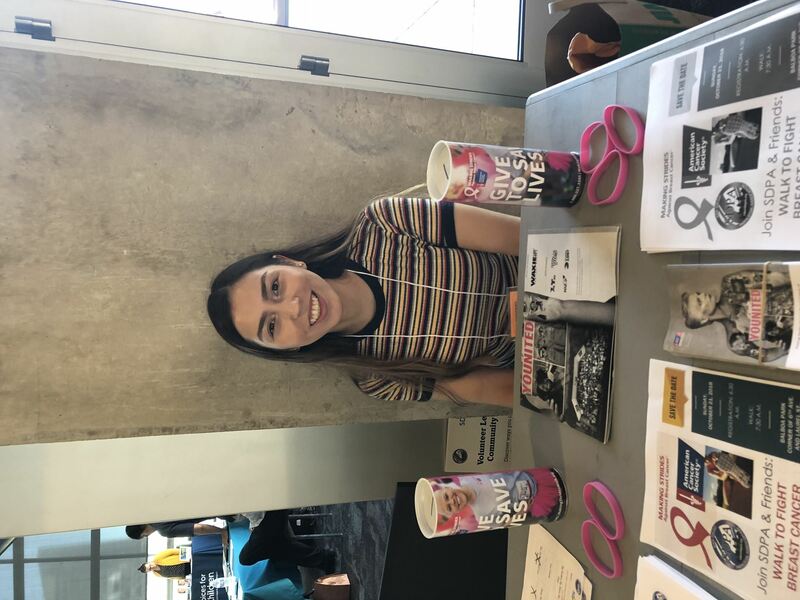 There are many great causes throughout San Diego, and this is a great way to find out more and help. Don't forget to register and sign up for our breast cancer walk! 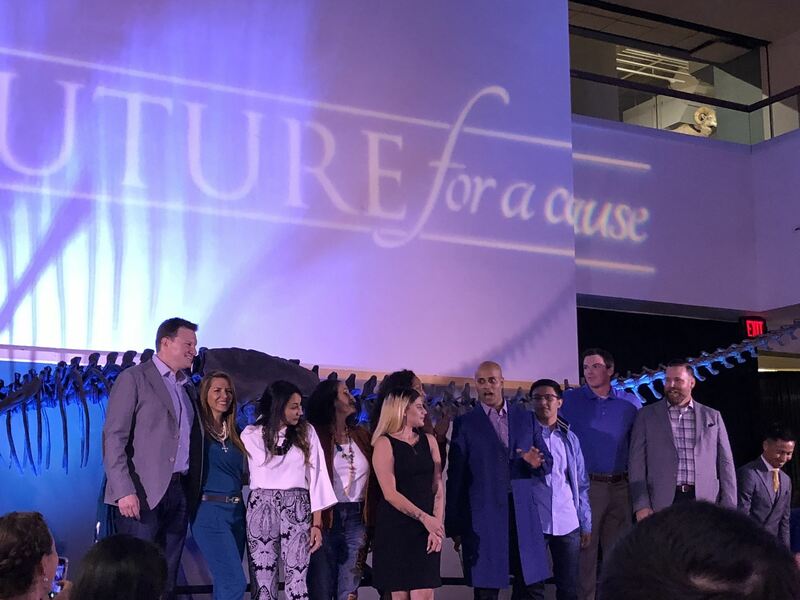 The ALA (Association of Legal Administrators) threw its 11th annual Couture for a Cause at the Natural History Museum at Balboa Park. 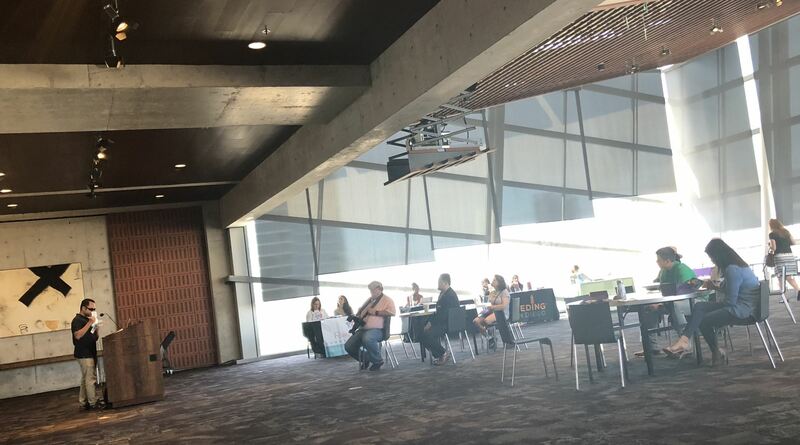 Attendees had a chance to participate in a silent auction for prizes donated by sponsors such as designer handbags, hotel stays, and hair styling services. All proceeds benefited Voices for Children and STAR/PAL, both organizations promoting youth welfare. 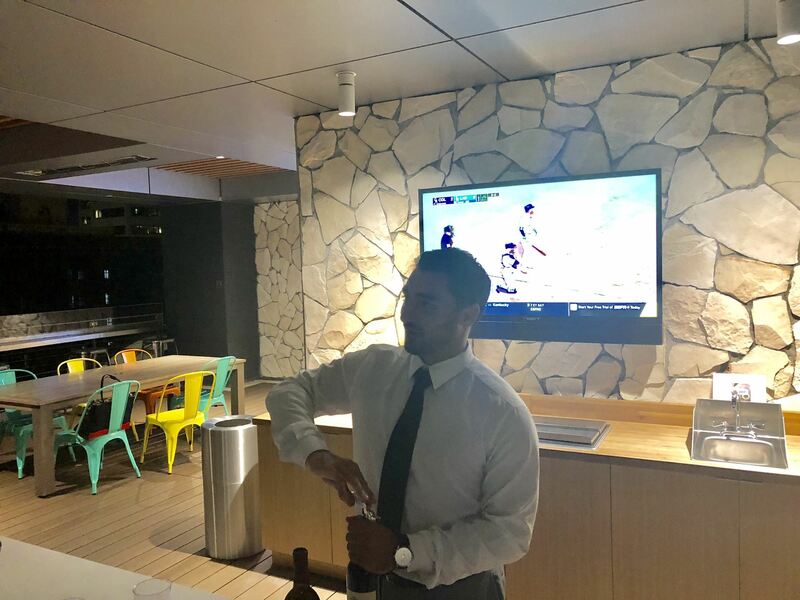 Many attorneys, paralegals, legal secretaries, and other legal professionals had arrived straight from work, and were ready for some nice, cold drinks. Servers offered trays of delectable hors d'oeuvres and bartenders flanked the area, offering drinks from beer to wine. 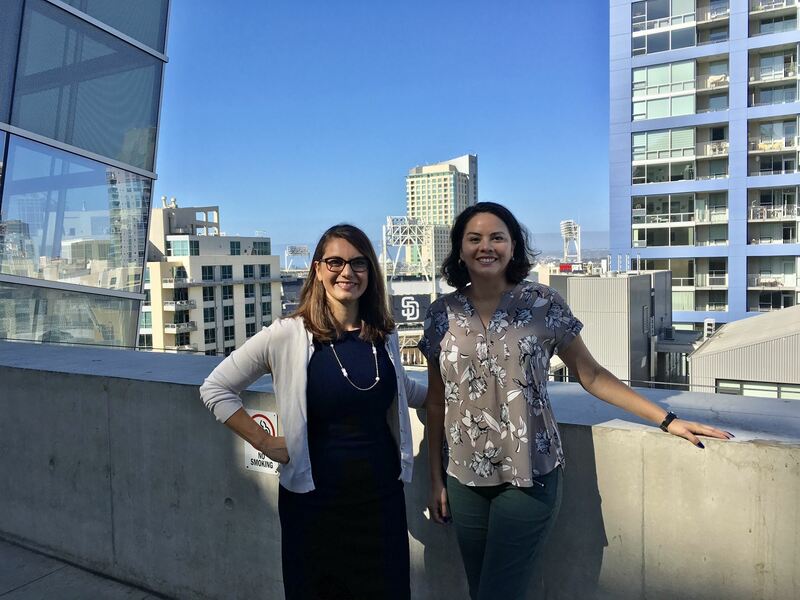 The San Diegan legal community is small, and it is common to cross paths with familiar faces. Several SDPA members arrived to show their support and to enjoy the fashion show hosted by Nicholas J. Fox of Foley & Lardner LLP and featuring announcer Douglas Glass of Glass Mediations. 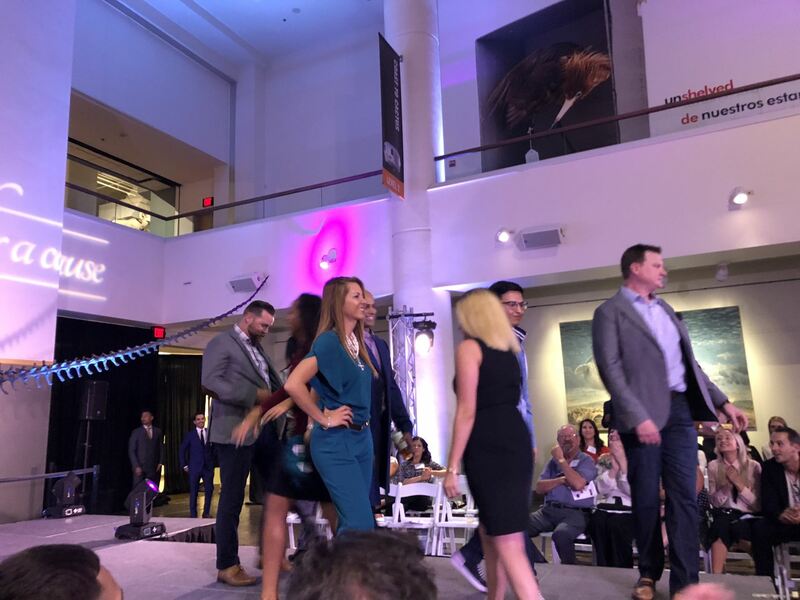 Models who walked the runway in fancy suits and outfits included prominent attorneys and legal business professionals such as Vincent Maguire from Knox Attorney Services Inc. and Vanessa Gerard, a San Diego Deputy District Attorney. The charities, Voices for Children and STAR/PAL, also made their presentations. Ashlee of Voices for Children spoke about her childhood and experiences in foster care and how her CASA volunteer helped her. 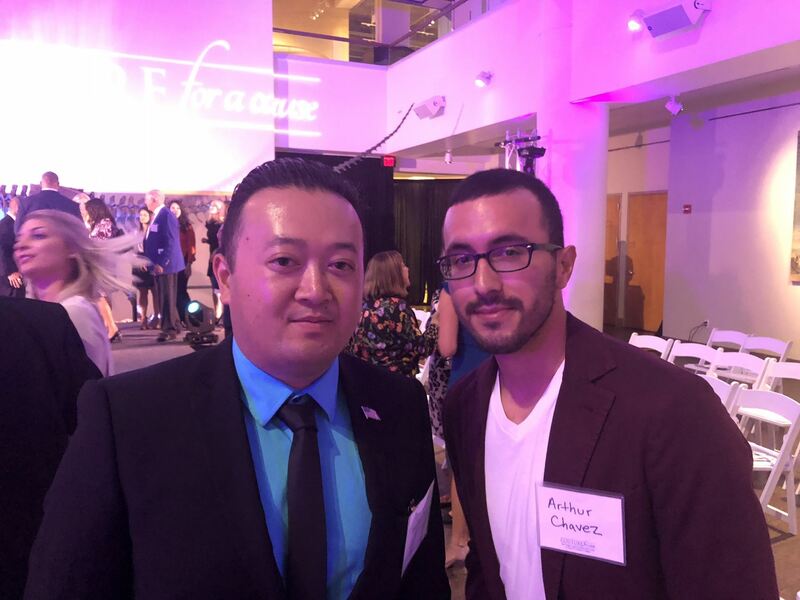 Gabriel of STAR/PAL spoke of the challenges he has endured in his personal life and how STAR/PAL's Making Changes program has helped him connect with people and find support during a difficult time in his life. To volunteer with Voices for Children, please email volunteer@speakupnow.org. To receive news about future volunteer opportunities and other STAR/PAL events, please email pdawson@starpal.org. 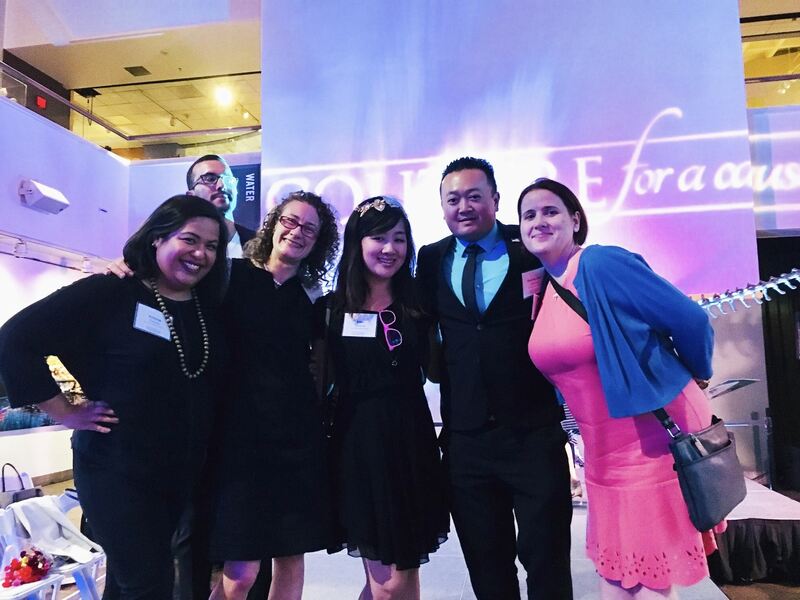 If you are interested in attending or volunteering at future events with SDPA, please go to https://sdparalegals.org/events and visit SDPA's Facebook Instagram, and LinkedIn pages. 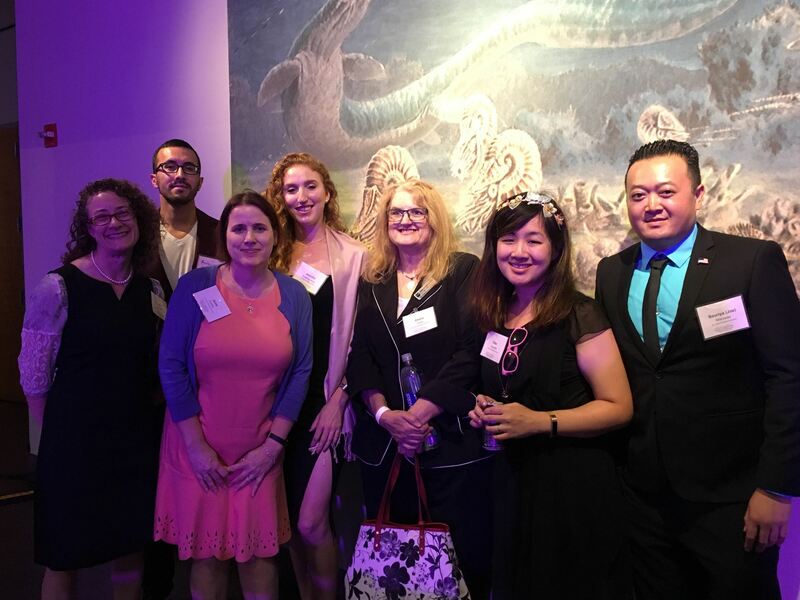 Photo (from left to right): Julie Schwartz (President), Arthur Chavez, June Hunter, Jennifer Keating-Wolk, Sheila Grela, Ellen Zacarias, Joe Maniwan. 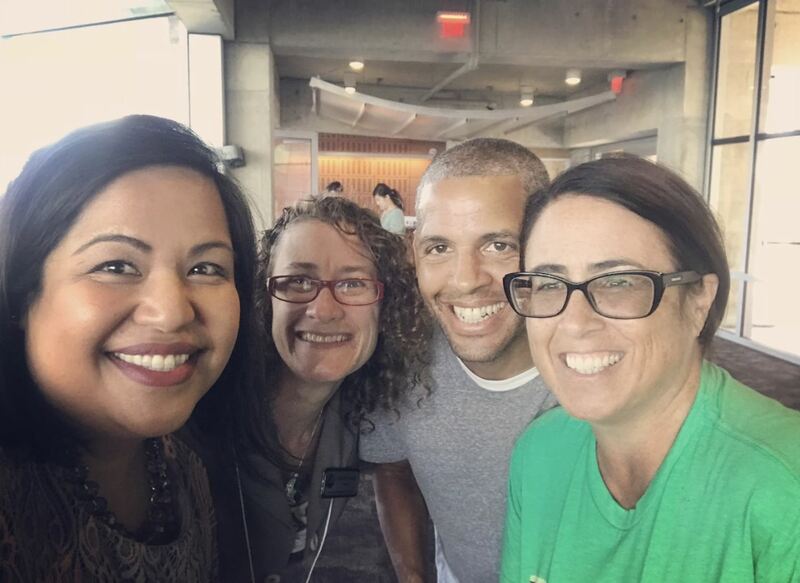 Photo from left to right: Kristine Custodio, Julie Schwartz, Ellen Zacarias, Joe Maniwan, June Hunter. 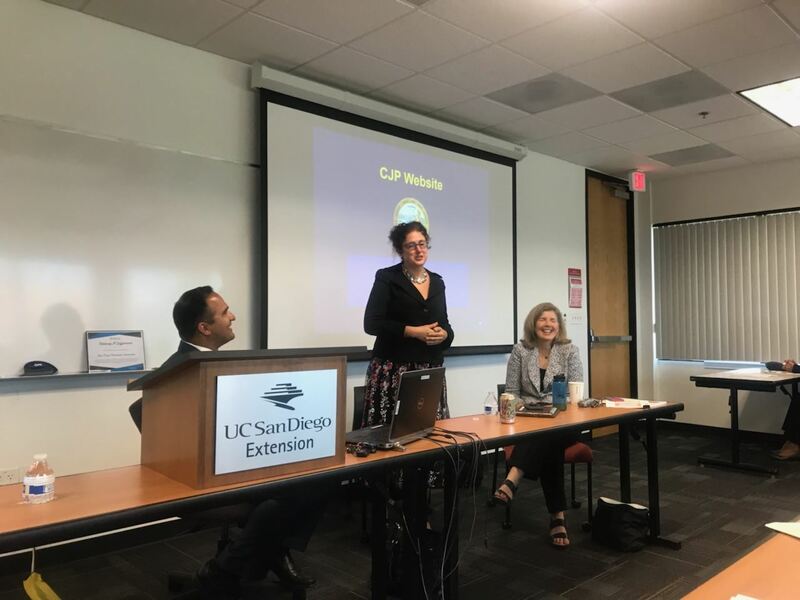 Many thanks to our speakers, SDPA members, and guests who made up our CLE presentation today at UCSD Extension! In addition, thank you to SDPA members and guests for bringing in school supply donations! They will be given to homeless youth through StandUp for Kids. Our panelists included The Honorable Laura J. Birkmeyer, Heather Rosing, Esq. 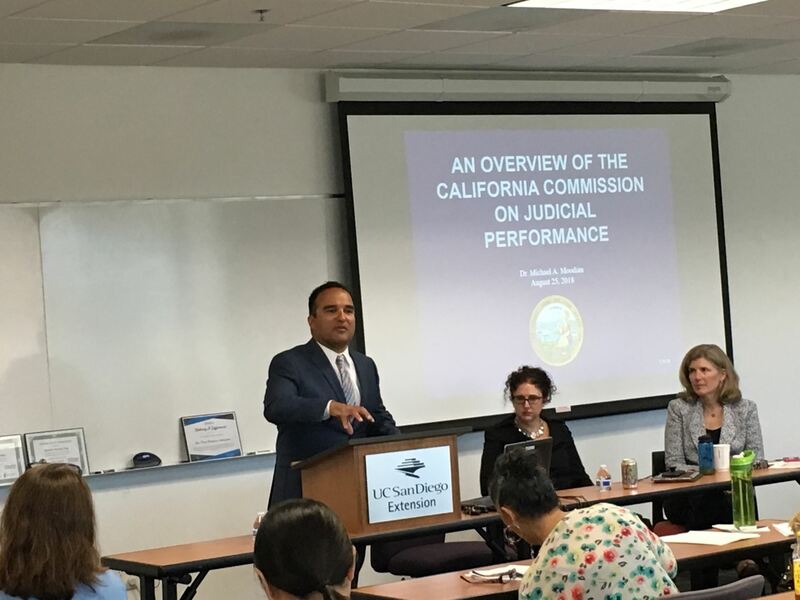 (President of the California Lawyers Association), and Dr. Michael Moodian (Commissioner for the CA Commission for Judicial Performance) for the excellent CLE presentation today. 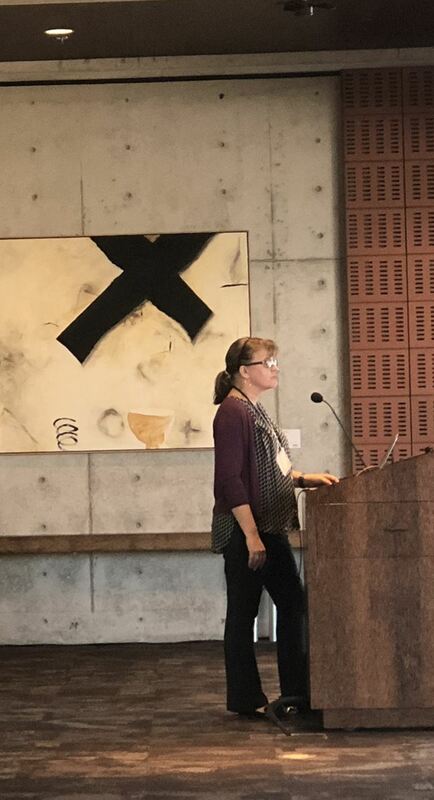 Also a big thank you to Julia Dunlap and UCSD Extension for hosting us today. Please check SDPA's Events page for more education, networking, and other events. If you are interested in participating in volunteering opportunities, please email probono@sdparalegals.org. 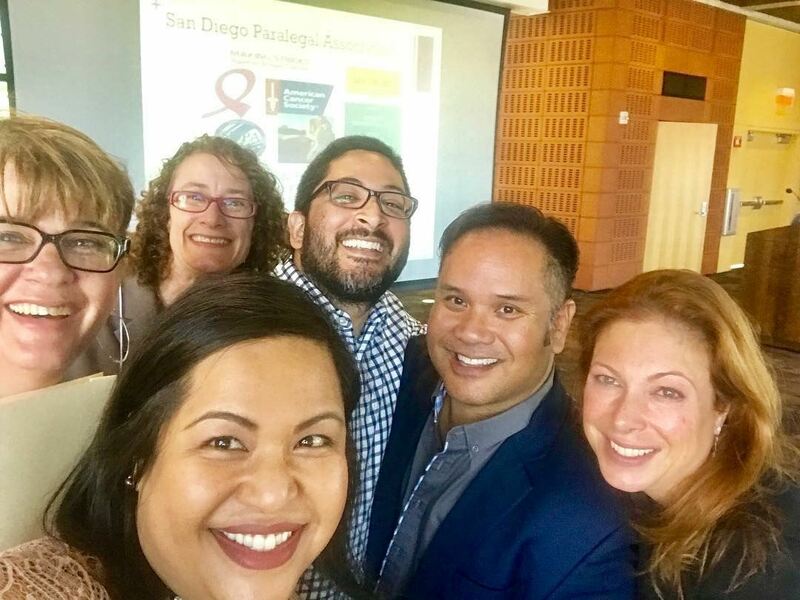 At SDPA's Board Retreat held on July 28, 2018 at Tyson & Mendes, board directors discussed committee chair assignments, administrative statuses, and upcoming events. 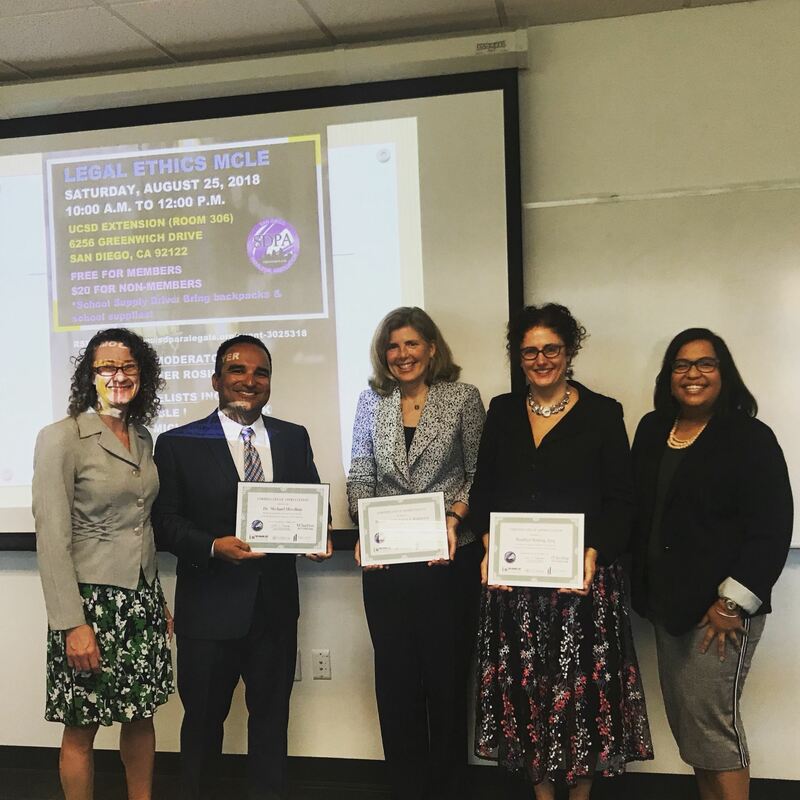 Stay tuned for more exciting events coming up later this year, such as the Pro Bono Fair in September and Legal Technology Educational Conference in October! 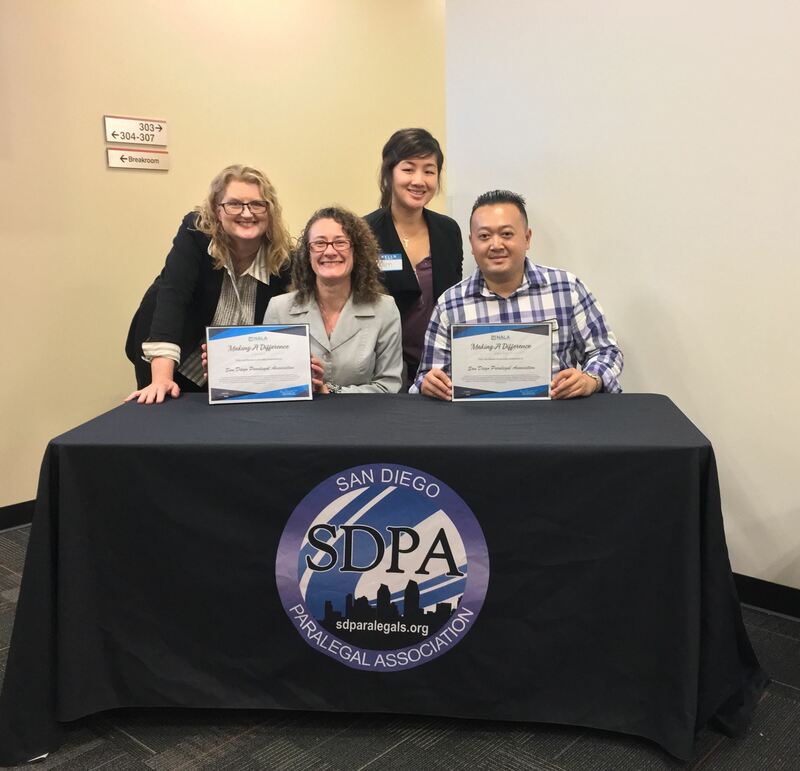 The SDPA Board celebrated its 2017 and 2018 National Association of Legal Assistants (NALA) Making a Difference Award, and welcomed Ellen Zacarias as a new interim director. The Board took a happy cookie break with attorneys from Tyson & Mendes. 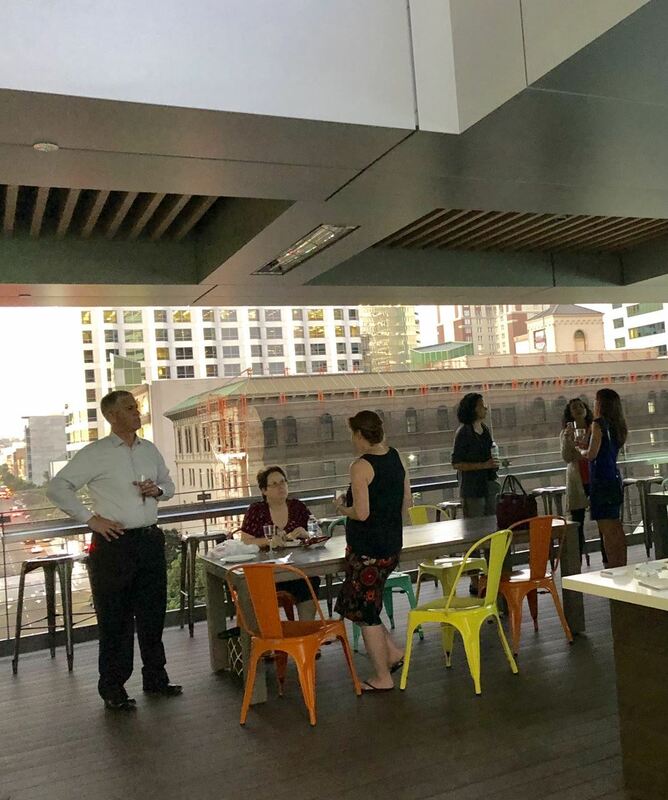 On July 25, 2018, SDPA members and guests socialized and networked at a mixer hosted by Veritext Legal Solutions, which laid out delightful trays of cheese, bread, meats, and fruits. Veritext offers deposition and transcript services to law firms and legal professionals. 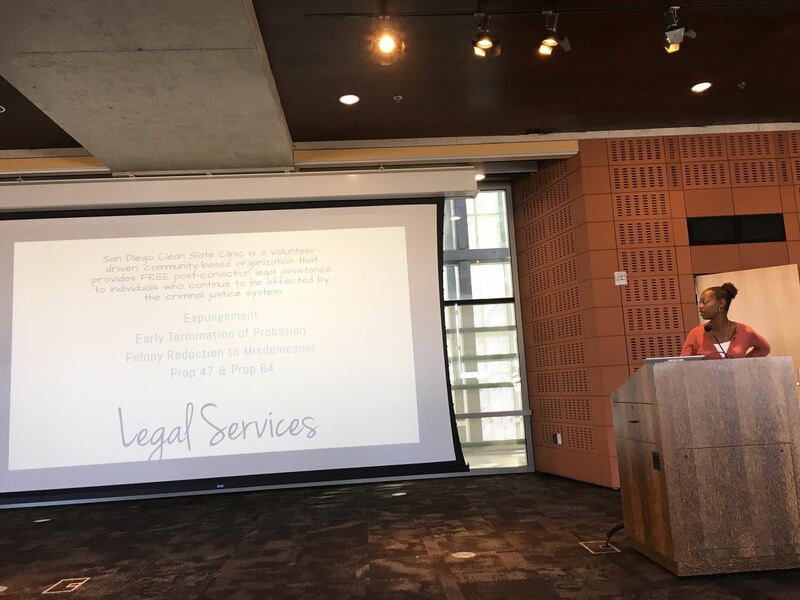 Among the attendees were students from Board Director June Hunter's UCSD Extension legal technologies class. SDPA encourages students to attend networking events to meet people working in the legal field. 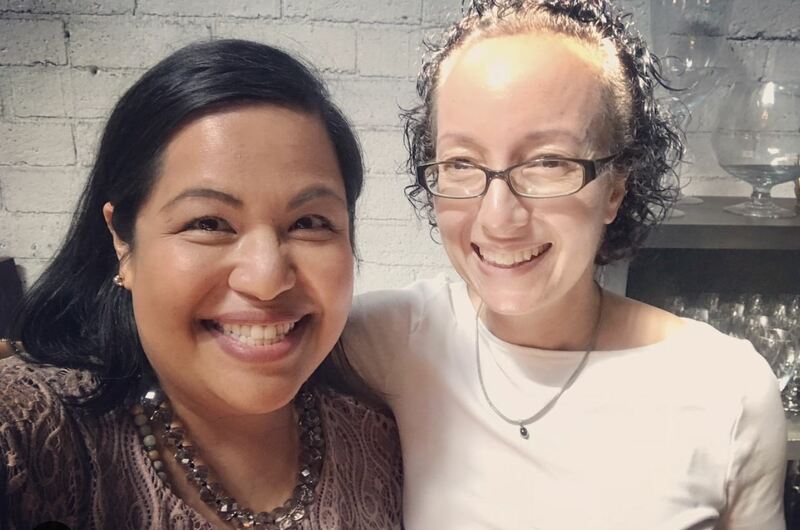 The legal field in San Diego is a small world! 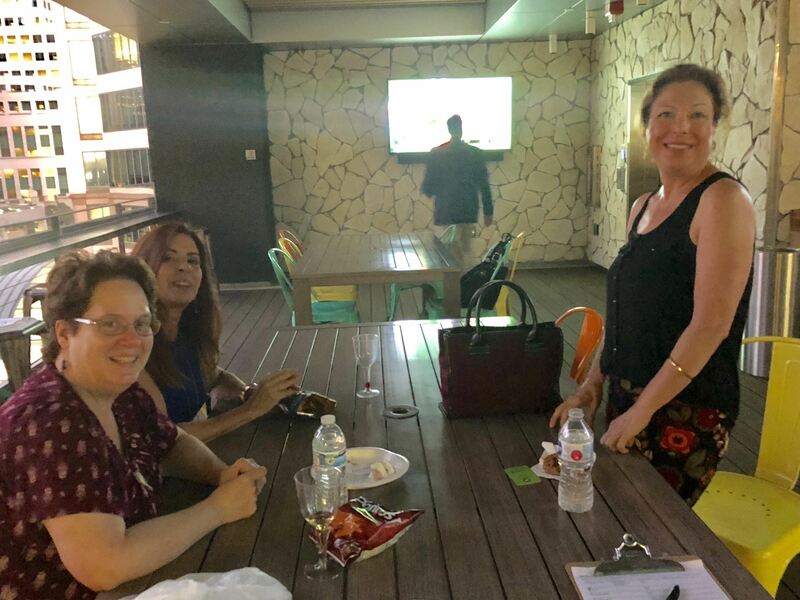 (Left to right): SDPA Board Director Kristine M. Custodio, ACP; Sheila Kristine Wise of Veritext; and SDPA President Julie Schwartz pose for a photograph at the July SDPA mixer hosted by Veritext. Robin, a homeless veteran, lives with her dog throughout downtown San Diego. She became homeless shortly after her husband passed away. “It’s nothing to be sorry about,” she said. “It is what it is.” She came to Stand Down to receive some services and food for herself and her dog, and a hot shower. Robin is one of over 800 homeless veterans who benefitted from the annual Stand Down event hosted by Veterans Village of San Diego. 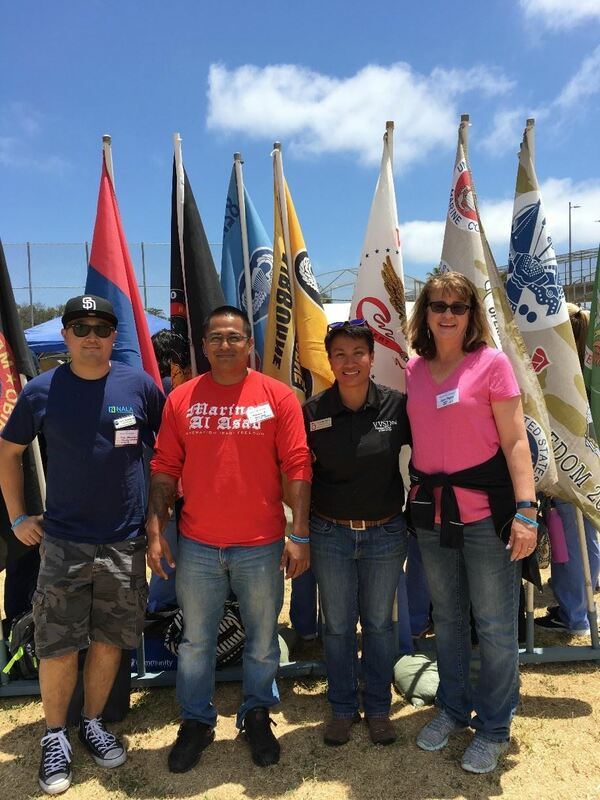 Veterans Village of San Diego (VVSD), SDPA’s Charity of the Choice for 2017-2018, hosted their annual Stand Down event at San Diego High School’s athletic track field on June 29 through July 1, 2018. Started in 1988, the Stand Down event was created to give homeless veterans a chance to rest, eat, shower, and receive services while others stand watch. Constructed in a circle around the athletic field, multiple tents offer services to veterans. At one tent, veterans can pick up free clothes. At another, they can receive medical or dental services from medical volunteers. Volunteer hair stylists also cut and shave hair. Substance abuse counseling and rehabilitation services are also offered. Breakfast, lunch, and dinner are served. In the evenings, bunks are set up within tents to provide a place for homeless veterans to sleep. Veterans apply for the in-house rehabilitation program, which provides housing and job training resources for candidates. For veterans with pets, there is a pet sitting area that offers food and care for pets while their owners receive services. 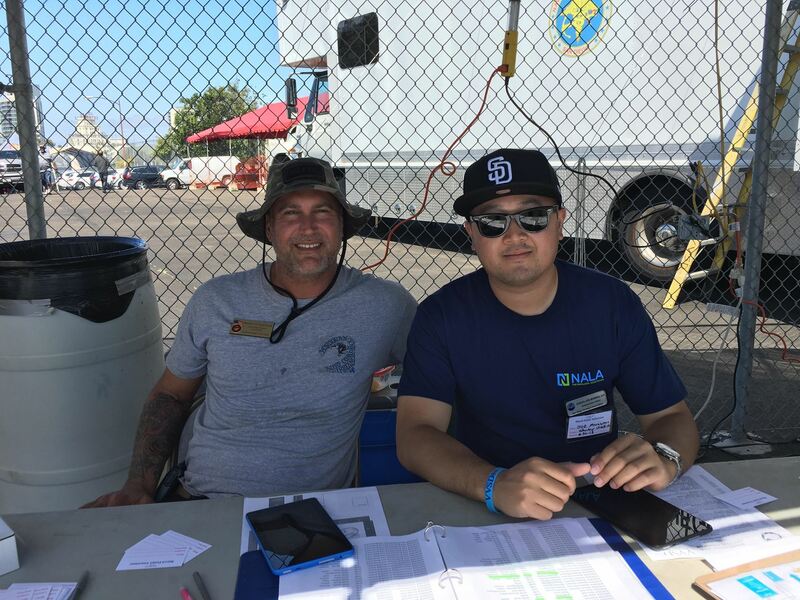 Several SDPA members volunteered at Stand Down 2018, assisting with different facets of the event, such as SDPA Board Director Souriya (Joe) Maniwan, ACP along with community projects coordinator Jonathan Thackston (JT) who welcomed incoming volunteers at the check-in tables. SDPA Pro Bono Director Dawn Regner, CP assisted with guiding volunteers to the appropriate station. Pro Bono Committee members Ellen Zacarias and Steven Aguirre provided services such as Hygiene and data entry. 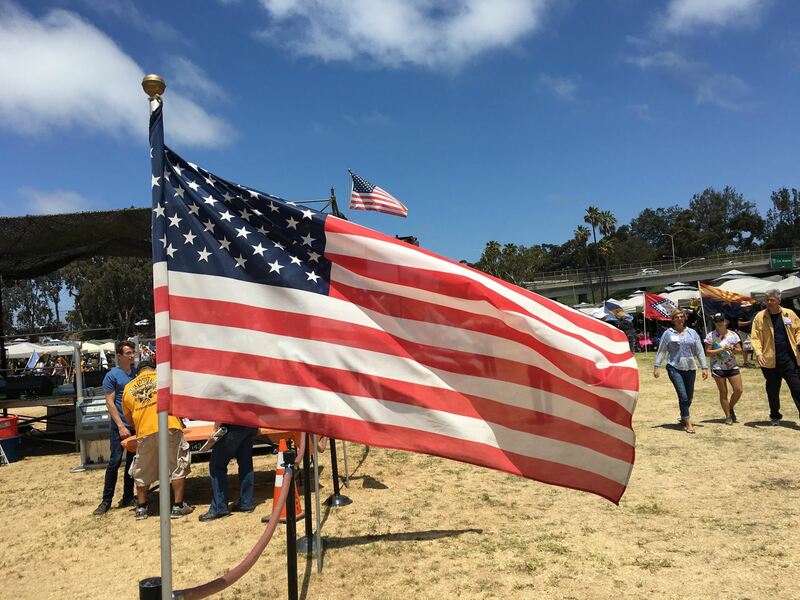 SDPA is proud to support homeless and low-income veterans at the Veterans Village of San Diego (VVSD)’s annual Stand Down event. All of this is made possible thanks to VVSD’s president and CEO Kimberly Mitchell, director Darcy Pavich, and community projects coordinator Jonathan Thackston (JT), and with the help of volunteers and sponsoring organizations. VVSD provides rehabilitation and employment services to military veterans, such as those who are coming back from military service in Afghanistan and Iraq. Caption: SDPA Board Director Souriya (Joe) Maniwan welcomes incoming volunteers at the entrance. 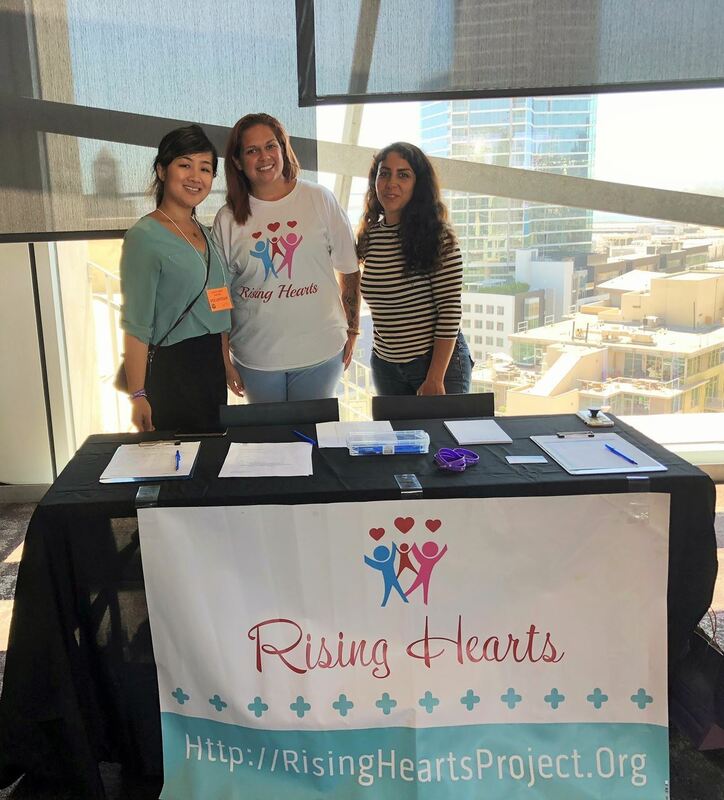 Caption: SDPA member Ellen Zacarias (second from left), with fellow volunteers at the women’s showers, where homeless veteran women receive access to hot showers along with zipper-locked bags of toiletries, razors, and hygiene supplies. Some services, such as haircutting, require a shower before the recipient can receive them.